Pictured is the Baston Umder 13 team that beat Yaxley White 2-0 in the League Cup. From the left they are, back, Mapalo Mwansa, Alton Strachan, Jamie Allen, Harvey Davis, William Howarth, James Roberts, Beck McCarthy, front, Oliver Tooth, Keelan Walker, Adam Blackbird, Lewis Duncan and Harrison Pearce. Baston became the first team through to the semi-finals of the Under 13 League Cup on Sunday. 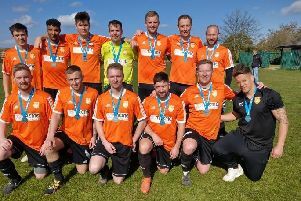 Their match against Yaxley White was the only quarter-final tie to beat the freezing weather and they ran out 2-0 winners thanks to a double strike by William Howarth. Pictured is the Yaxley White Under 13 team beaten 2-0 by Baston in the League Cup. From the left they are, back, Carlo Manganiello, Owen Goodacre, Leo Brando, Bailey Clifton, Luca DeCanio, Tom Slack-Humphrey, Flynn Harrison, front, Gemal Korkmaz, William Guy, Lewis Baughan, Max Wild, Mako Gouba and Ethan Canfield. That was the only game to take place in the Under 13 age group and there were only two matches played at Under 14 level. In Division One, Park Farm Pumas Blue moved up to fifth spot with a 4-1 win over Netherton Phoenix. Their scorers were Callum McAuley, Leon Ofosu, Akinola Ojelade and Dennis Selway with Daniel Laxton replying for Netherton. Deeping Rangers Blue were big winners in the other Under 14 game. They won 5-1 at Northern Star Black in Division Two with goals by Dylan Taylor (2), Joshua Cook (2) and Tyler Mayoh. Cameron Scott scored for Star. Deeping Blues went three points clear at the top of Under 12 Division One with a 3-0 win over Riverside. Billy Zyberi, Finlay Adkins-Krijgsman and William Turner got their goals.